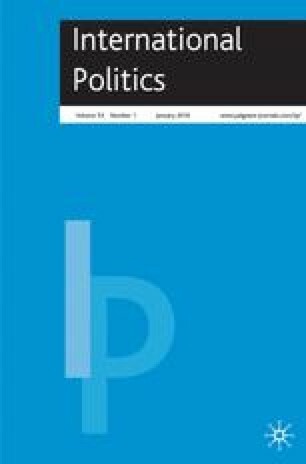 This article argues that an engagement with the political philosophy of Leo Strauss is of considerable value in International Relations (IR), in relation to the study of both recent US foreign policy and contemporary IR theory. The question of Straussian activities within and close to the foreign policy-making establishment in the United States during the period leading up to the 2003 invasion of Iraq has been the focus of significant scholarly and popular attention in recent years. This article makes the case that several individuals influenced by Strauss exercised considerable influence in the fields of intelligence production, the media and think tanks, and traces the ways in which elements of Strauss’ thought are discernible in their interventions in these spheres. It further argues that Strauss’ political philosophy is of broader significance for IR insofar as it can be read as a securitising response to the dangers he associated with the foundationlessness of the modern condition. The article demonstrates that the politics of this response are of crucial importance for contemporary debates between traditional and critical IR theorists. I am indebted to Larry George, Maja Zehfuss, Angie Wilson and Chris Rossdale for their engagement with this article and the broader project from which it is taken. Thanks are also extended to Rob Howse for informative discussions relating to several issues raised in it, and to an anonymous reviewer. Department of Defense Inspector General. (2007) Review of pre-Iraqi war activities of the office of the under secretary of defense for policy. 9 February, http://www.fas.org/irp/agency/dod/ig020907-decl.pdf. Engdahl, F.W. (2005) Behind Bush II's ‘War on Tyranny’. 12 February, http://www.studien-von-zeitfragen.net/Zeitfragen/War_On_Tyranny_/war_on_tyranny_.html. Jaffa, H.V. (2003) American conservatism and the present crisis. 12 February, http://www.claremont.org/publications/crb/id.917/article_detail.asp. Mansfield, H.C. (2002) Then and now, interview with Gwen Ifill on NewsHour with Jim Lerher, 13 September, http://harveymansfield.org/multimedia/then-and-now-mansfield/. Project for the New American Century. (2001) Letter to President Bush on terrorism. 20 September, http://www.newamericancentury.org/Bushletter.htm. Project for the New American Century. (2002) Letter to President Bush on Israel. 3 April, http://www.newamericancentury.org/lettersstatements.htm. Reynolds, P. (2006) End of the neo-con dream. 21 December, http://news.bbc.co.uk/1/hi/world/middle_east/6189793.stm. Rhem, K.T. (2003) Wolfowitz says disarming Iraq is ‘second front’ in War on Terror. 11 March, http://www.americagov/st/washfile-english/2003/March/20030312153708rethcirj0.0325281.html.